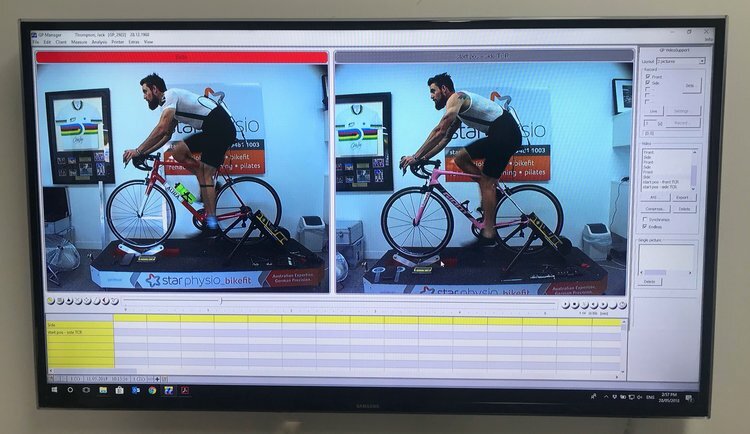 "THE GEBIOMIZED FIT PROCESS HAS ENABLED ME TO PUT MY MIND AT EASE AND CONCENTRATE SOLELY ON PEDALLING..."
There are three main reasons for a bike fit. To increase comfort, to increase efficiency and to prevent injury. I had undergone a fit on the RETUL system in February and this had been great in adjusting from my position previous, however, in wanting to reap the most benefit from my fit and test the very latest in 'bike fitting technology' I decided to employ the expertise of the 'gebioMized' fit process with Damian Oldmeadow at Star Physio in West Perth. For what it’s worth, the likes of Trek Segafredo, Katusha Alpecin and Cervelo Bigla also employ gebioMized technicians to look after their athletes. An impressive list of pro teams if you ask me. As a bit of background for you, Damian is a Physiotherapist by trade and highly skilled at his job. 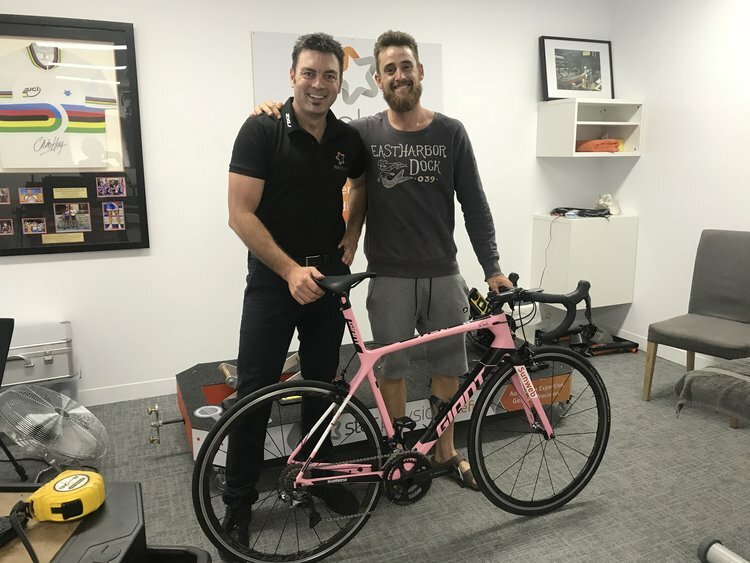 Damian has worked with the likes of Chris Hoy and the Great Britain track team, so his knowledge of all things cycling is up there with the best of the best. Damian treats athletes from the Mitchelton Scott team, when they are back in Perth, and has fitted several of them to their bikes using the gebioMized fit process. The likes of Robbie Power, Jai Hindley and Jessica Allen have all been fitted by Damian. No more needs to be said…their results speak louder than words. Essentially, the desired outcomes are the same, to achieve comfort and efficiency and to prevent injury. The way each fit process goes about achieving these outcomes varies greatly. The fitter then analyses the pressure mapping information to determine where exactly the athlete is sitting on their saddle and how their power is being transferred through the pedals. The film gathered is converted to slow motion and the fitter can measure angles based on the athlete’s position. Based on this package of data, the fitter then makes small, calculated changes to the athlete’s position and carries out the 'data gathering process' once more. This process continues until the athlete's position is optimised and their position on the bike is as close to perfect as possible. As you can see from the above, the two fit processes differ quite substantially. Where the RETUL system uses nodes placed on the athlete’s body, the gebioMized system uses pressure mapping on the actual contact points. The point of this article is not to compare the two fit processes. As my gebioMized fitter Damian pointed out, there is no wrong or right position on the bike, it is all a matter of comfort, efficiency and injury prevention. What I will do, is outline what impressed me about the gebioMized system and point out the different outcomes in my eventual fit. Measurable data is a huge thing for me. I like to be able to look at numbers and figures and understand exactly what they mean and their possible knock on effect. The gebioMized system ticks this box. In my opinion, the pressure mapping incorporated as part of the gebioMized fit process is by far and away the most detailed piece of 'fit equipment' on the market today. In my case, by looking at the pressure data gathered from the saddle, we were able to see that I was sitting both off to the left of my saddle and on the nose. Paired with the slow-motion video capture, Damian could see that this was because my saddle was too high and too far back. As soon as we dropped my saddle, and moved it forward, I was able to sit entirely square and on the sweet spot of the saddle. The pressure mapping device confirmed this. Moving onto the cleats, the way that I was driving through the pedals was inefficient with a huge amount of force coming from behind the cleats themselves. Damian could see that this was attributed to my cleats being too far forward. Over the course of the fit we ended up moving them back close to one centimetre, that is huge!!! The shot on the left was actually my eventual position (note the increased knee bend and reduction in reach.) The shot on the right was of the Giant prior to the final tweaks. Because the Giant has an integrated seatpost, we made all of the changes on the Aura and then replicated the position across to the Giant. At the completion of the fit, I felt great on the bike and no longer rocked from side to side to compensate for my saddle being too high. I felt planted, powerful and comfortable. Following the fit process I flew directly to Thailand for 3 days of racing followed by a week of touring. This is not something that most would recommend having made drastic changes to their bike position however my comfort levels were and continue to be at an all time high. It's now been a few months since the fit. I’ve ridden a few thousand kilometres along with a few longer 24hr style rides in excess of 500km and I haven't needed to adjust a thing. Those that know me well, know that this is outside the norm. In the past I have always played with my position in search of 'ultimate comfort.' The gebioMized fit process has certainly found this for me and has enabled me to put my mind at ease and concentrate solely on pedalling. 602km and 6,316m elevation from Tokyo to Osaka within 24 hours. I've never felt so comfortable on the bike after such a long stint. If you're in need of a fit or would like to put your mind at ease in knowing that you're in the best possible position on the bike, then I recommend giving Damian a call and scheduling in an appointment. To many happy kilometres ahead!